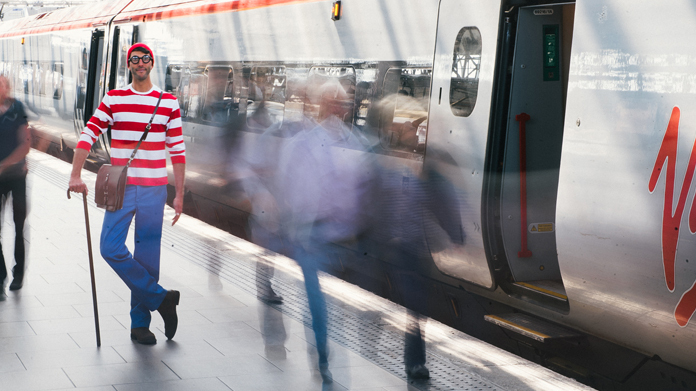 In the early hours of a Monday morning, three teams of H&G-ers were dispatched across the Virgin Trains network to install 100 stickers of Where’s Wally? Ranging from A5 right up to his full height (6’4”, since you ask) Wally is hidden everywhere from London Euston Station, to Manchester Football Museum, to Edinburgh Museum of Childhood, and even a few on a select number of Virgin trains. We’ve been encouraging families to undertake (what we believe to be) the UK’s largest ever Where’s Wally? hunt. The family that finds the most Wallys will win a family weekend away – not a bad reward for keeping the kids entertained! The social media uptake has been buzzing since the moment we launched – with the Edinburgh Fringe sending thousands of people past our Wallys on a daily basis and plenty of thesps getting in on the hunt. And in true Virgin Trains spirit of fun, several train managers have even donned their best Wally outfits whilst they go about their business. The campaign has so far delivered over 200 pieces of coverage, including in Sunday Mirror Notebook, Sunday Express S Mag, The Sun, as well as going out on the PA travel wire to every regional newspaper along the West Coast Mainline.